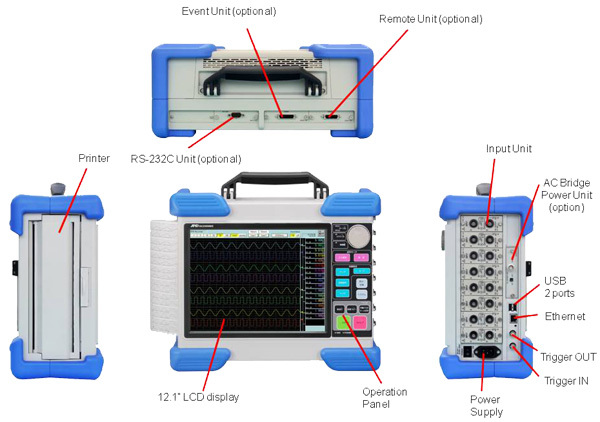 The Omniace RA2300MKⅡ is an data acquisition system with easy-to-use recording and analyzing functions. The virtual amplifier setting screen, touch panel and large LCD dynamic waveform display shorten and simplify setup and measurement time. The Omniace is equipped with a variety of measurement modes including long-term recording on a 160 GB hard disk (HD) or 256 GB industrial solid state drive (SSD) and a memory mode capable of capturing high-speed phenomena with excellent reliability. USB devices with security features cannot be used due to issues regarding authentication processing. If you need to record signals on paper, you need aChart Recorder. If you look for a chart recorder, the best isOmniace. Sanei Instruments has manufactured Electromagnetic Oscillographic Recorders and Pen Oscillographic Recorders for 60 years. Sanei developed the Omniace to print signals on thermal paper and has been valued by our customers for 30 years. A&D acquired this technology and designed and released the new Omniace RA2300MKII. 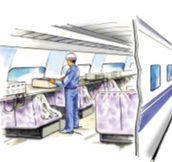 Our noise-resistance technology was developed with input from our customers in the railroad, aerospace, construction, civil engineering and steel market. Waveforms display during configuration to allow for precision adjustments. The new MKII can use 11 input amplifiers as well as communication units, AC bridge power supplies, recording paper and storage box designed for the older model. 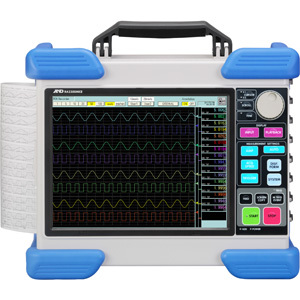 12.1 inch LCD dynamically displays waveforms across 16 channels. Numerical display and waveform division can be configured by application. Directly input voltage, strain, temperature, vibration, pressure or rotational pulse signal with 11 types sensors inherited from the RA1000 and RA2000 series. Pen recorder mode is used to output data to chart paper directly. This mode shows pen-written waveforms on the screen. Amplifiers and chart speed can be set similar to a chart recorder. HD recorder mode saves data to a 160 GB HD or 256 GB SSD for long term storage. One microsecond sampling is possible when only 1 channel is used. When all 16 channels are used data can be recorded every 10 µs. Data is recorded to two gigabyte chunks. When more than two gigabytes is recorded another chunk is created and recording continues. Previously recorded data can be viewed during measurement. Moreover, this also limits damage caused by file corruption caused by power outages, etc. during recording. The Omniace is a digital recorder that converts analog input signals for storage as digital data. Error is introduced to the recorded data due to the relationship between the speed of this AD conversion and the frequency component of the input signal. When the Omniace records an input signal, it is possible to record high frequency noise independent of the print speed. Additionally with the HD recorder, data can be stored to a hard disk for analysis. With this method, raw data is faithfully recorded at the designated recording speed (every 10 ms in this example). Sampling is performed at the maximum sampling speed over the set recording interval (10 ms in the example) and the maximum and minimum values are recorded. This allows compression of data without losing peak values. However, peak data requires twice the recording capacity of the sample data method. Data can be looped endlessly when recording over uncertain timeframes with unpredictable anomalies. With this function the most recent data is always stored to the hard drive. Two gigabytes can hold two-hundred and nine 30 m recording paper rolls. Record data at high speeds (up to 1μs) to internal memory (2 mW/ch). Memory from unused channels can be used for up to 32mW recording on one channel. Additionally, various measurement conditions can be set with trigger functions. Data input to memory can be output to recording paper or other storage device. By partitioning the memory block, it is possible to repeat multiple recordings. Data is recorded until all partitions are full. After recording data over all memory blocks, data is overwritten from the beginning. Recording ends with the stop key. 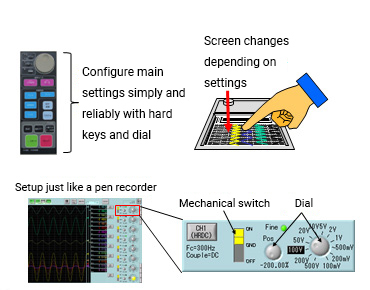 WINDOW - Recording begins when the signal level of the specified channel falls within the set range (IN) or when it deviates from the range (OUT). With this function a trigger point is set as a boundary and data leading up to the trigger point can also be recorded. Data can be recorded before and after the trigger point which is set as a percentage of the full memory capacity of the block. The example shows the pre-trigger set to 25%. In this case data before the trigger event will be saved to 25% of the memory capacity of the block. Multi-recorder mode enables simultaneous recording to paper output, hard drive and memory. It is possible to record sudden phenomenon to the memory while recording on the chart paper or to the HDD or SSD. This mode records input signals from selected channels on an X-Y chart (X-axis: 1 channel, Y-axis: 3 channels). Output can be printed to chart paper at high resolution (1600 dot x 1600 dot). The RA2300 MKII is equipped with functions to search large amounts of data quickly. The waveform image of the recorded data for one selected channel can be displayed on the thumbnail bar. This data is easy to read and can be expanded by touching the point you want to see in greater detail. The four methods below can be used to search data. Time - Jump to a specific time. Address - Jump to a time from the start of measurement. Significant point - Jump to the maximum and minimum values. Event - Jump to the marks made during recording. Scale, signal name, numerical value and/or time interval can be displayed for waveforms between the 2 cursors on the replay monitor. Memory data and measurement conditions are automatically saved to the hard drive when the device is turned off. This information is automatically loaded from the hard drive the next time the device is started so measurement can begin with the same settings. Up to 4 measurement conditions can be saved. 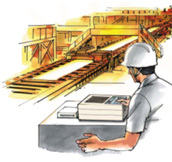 Measurement conditions can be saved for each test, eliminating the need to make complicated configurations each time. 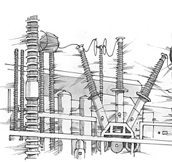 Automated measurements are performed at specified times and intervals. The RA2300MKII can output files in CSV format for processing measurement data with spreadsheet or analysis software. 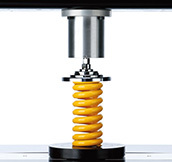 It is equipped with functions to reduce measurement data size or convert large amounts of measurement data at once. The RA2300 can be controlled remotely via Ethernet connection to a PC. You can use Unifizer NS3300 (optional software) to record data, configure settings and start recording. File sharing with a PC via Ethernet is possible. You can transfer the recorded data to your PC. File sharing with a PC via Ethernet is possible. You can transfer the recorded data from your PC. 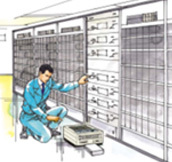 When the RS2300MKII is connected to an uninterruptible power supply (UPS), the shutdown procedure will be performed automatically during a power failure. If a power outage occurs during long term recording, the recording operation can be terminated by a signal from UPS and the RA2300MKII can be turned off. High speed (100 mm/s) and high density (80 dot/mm at 25 mm/s) recording is possible. Easily change the division of the waveform record and the width of the recording area, etc. Specifies the position of event waveform of signal No. 8. 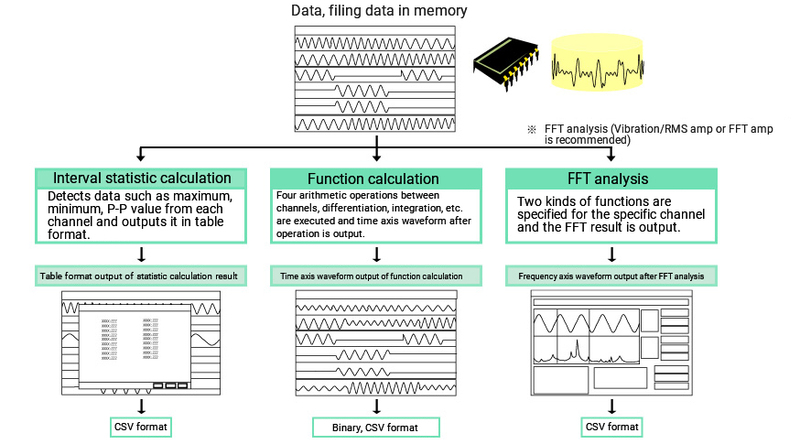 This unit performs arithmetic processing (interval statistic calculation, function calculation, FFT analysis) on the data stored in memory, HDD or SSD and displays the results in table, time axis waveform or frequency formats. Experiments that required a data recorder for measurement and analyzer for analysis can be done with the Omniace alone. 2-CH High Resolution DC Amp. 2-CH High Speed DC Amp. *1: AC bridge power supply (RA23-141) is required. *2: AP11-106A, AP11-107 and AP11-108 do not comply with RoHS directive of CE. Chart Speed: 100mm/s to 1mm/min.